The other day we brought Momma Pig (MP) up to our place to have babies. Now, MP is not the friendliest of sows. Not mean or aggressive, she just doesn’t want you next to her. Or touching her. She’s been like this ever since she came to us in January. Yet when we brought her up, something changed. In her new pen, she was oinking, oinking, oinking at me while I filled our feed buckets with water. We wanted to move her when it was cool, so I hadn’t filled up her mud hole yet. Water in the hole and oinking stops. I wanted to gain her trust, so she got a few big squash and a melon while I finished cleaning out her stall. She watched me as I shoveled out old bedding and told her about what I was doing and what was to come. “MP, you need a nice clean stall so you can have nice clean babies next week. NOT this week, next week, right? No early babies like last time. I’m making a nice pasture for you to eat in and you can go swimming in the pond to cool off now, too.” And on and on I went with MP giving a grunt here and there. Then she stood next to me. My heart almost stopped. MP came next to me. On her own. Well, that seemed like my cue to give her a bit of a rub down the back. She shook her booty a little, so I reached down and rubbed the side of her belly. With that, MP flopped down for a full belly rub. My heart did stop then! A few days after Trudy, our sow, gave brith we had some rain move in. She was standing outside the barn stall waiting for dinner and with all the rain, it was quite the muddy mess. 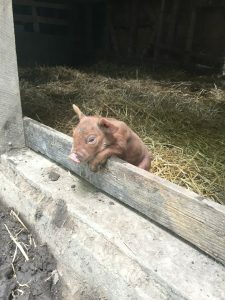 I could hear the babies oinking around inside and one decided to pop his head out the door. Trudy did not like that! She turned and gave him a stern oink that set him shooting back into the stall. I don’t need to speak pig to know she told him outside was no place for him and to GET BACK IN THERE! Watching and listening to the pigs is by far my favorite thing. The sow will go lay down away from the piglets and let out an oink that’s the dinner bell and all come running. When they get too bitey, she lets them know. When one isn’t latching on as he should, she directs him until he gets it right and then all oinking stops. I can tell when the dogs are warning a predator to stay away versus warning us that a cow has gotten out. The rooster’s crow can either be calling the girls for a treat or warning of a hawk. I can tell when the cow’s moo is just calling baby to come or letting us know something is not right. Our job as their caretakers is to watch them and listen to what they are saying and make sure we do what is needed. I’ve lost track of how many times I’ve run out to the pasture because of an odd crow or moo. I feel like I know most of the sounds they make and when a new one happens, I need to go check things out. We’re a small farm. Part of the reason we stay small is so we CAN listen. If we had 50 sows or brood cows it would be harder to listen. I couldn’t spend the time I do watching, listening, and yes, just plain babying them the way I want to. The way we feel they deserve to be treated. Our days are filled with chores and projects. Some days are busier than others, but every day we take time to watch our animals to asses their health and wellbeing. And I always have one ear turned to them, listening, assessing, and waiting to hear what they have to tell me. I’ve never had an animal yet that I didn’t talk with all the time in spite of the weird looks that I often received, lol. If we care enough and take the time to listen to them, they can indeed tell us so many things that we need to know. I loved this article, Serena. Thank you for sharing it with us!! I love this post! And I loved coming to see all your beautiful animals! Thank you again for everything you and Fred do! You are so welcome! It was great having you both out. Thank you for being the wonderful farmers that you are. I know your animals appreciate you both. Animals are very smart and we can learn from them if we just listen. Thanks, Barbara. Sometimes they are TOO smart! And we do learn a lot from them. I love the way you run your farm, the loving care you provide your animals. You and Fred make the world a better place to be. Get great recipes and health tips, know when products come available, and where to find us during the market season. We will also keep you up-to-date on what's happening on the farm. What area are you closest to? 573-764-2324 please leave a message . Farm hours are by appointment only. LOOK! We’re in ACRES Magazine! PLUS, be the first to know when products are available. Welcome to our farm family!